Laser Kaleidoscope Integrates Adafruit Components and 3D Printed Parts #3dthursday « Adafruit Industries – Makers, hackers, artists, designers and engineers! When I was at Maker Faire Detroit back in July I saw this laser spinner thingy called “The Interociter” and decided I had to have one. And by “have one” I mean “make one”… so I did. So where were we? Oh yes, the project! It’s really simple: a laser is pointed at a mirror, and that reflects the laser onto another mirror, and that one reflects it onto another mirror, and then it shows up on the wall. 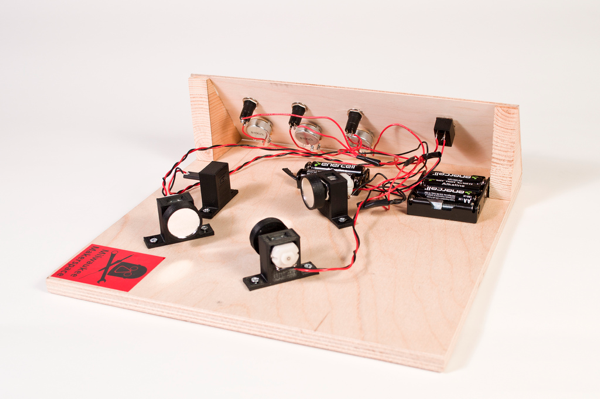 You can make the motors spin by turning them on with a pushbutton, and then adjust the speed by turning the knobs. There are 3 motors (an earlier prototype had 4) and by setting them all to different speeds, you can get some crazy patterns going. So how does it work? The laser hits the first spinning mirror, and creates what appears to be a circle. It’s really a single dot, but it’s spinning around so fast it looks like a circle. Add a second (and third) mirror, and since they all wobble just a little bit, you get much more than a simple circle.